“A collaborative project between Janine Magelssen and Lise Bjørne Linnert, sound artist Nils Olav Boe, choreographer and dancer Øyvind Jørgensen. The four artists have found areas of close proximity between the different works, which generates a dialogue between them. It is this conversation, which happens between the art pieces in the exhibition that creates the so- called “white noise”. 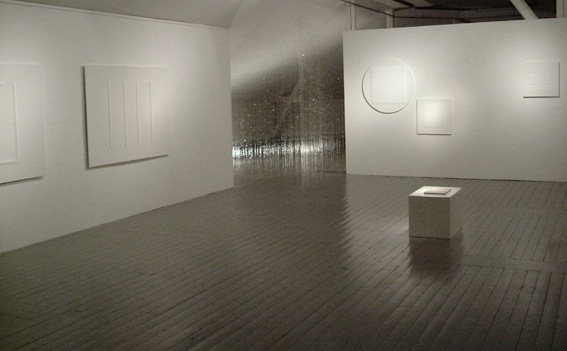 White Noise were shown at Art League, Houston Texas in 2006 and at Kunstbanken, Hamar in 2007. A publication was made for the exhibition with text by Art Historian Janicke Iversen. Janine Magelssen, Lise Bjørne, Niels Olav Bøe and Øyvind Jørgensen. The exhibition project White Noise, is a remarkable collaboration between two visual artists, a composer and a dancer and choreographer. The encounter between these four artists is a “happy coincidence”. It is rare to experience how different artistic expressions complement each other, and thus opens up new spaces for interpretation, in the way it happens in White Noise. In this project, each artist expresses her or himself in accordance to their own premises. However, the four artists have found areas of close proximity between the different works, which generates a dialogue between them. It is this conversation, which happens between the art pieces in the exhibition that creates the so- called “white noise”. The title of the exhibition, which originates from the world of music, is the term describing the soundscape occurring when different sound frequencies are layered on top of each other. The result is barely possible to hear. The different frequencies and expressions put together creates a form of silence that is filled with sound. This is also applicable for the exhibition, a filled silence. 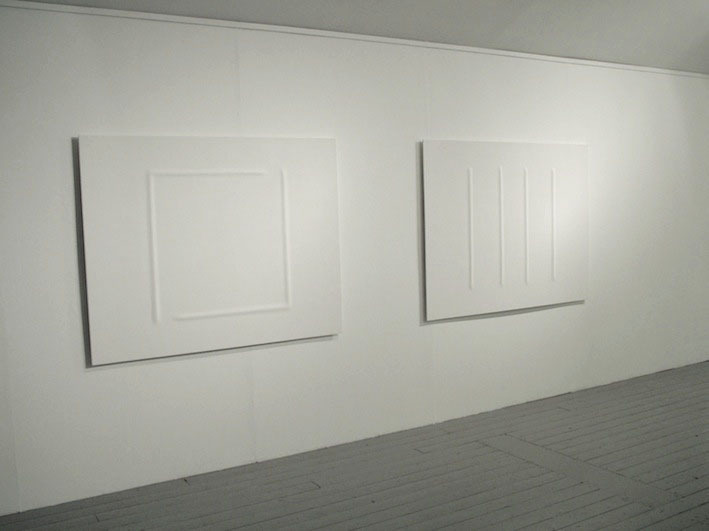 The wall objects created by Janine Magelssen (which are white objects against a white wall) are situated on the border between being form and not form, or between being visible and invisible. Her objects radiate a sensuality and tenderness, which makes me as a viewer want to touch the soft surfaces and sink into them. 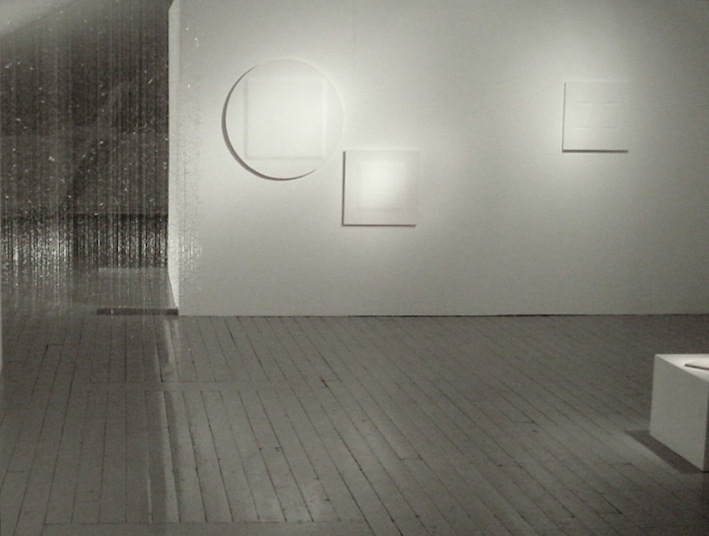 Magelssen’s objects are white forms and surfaces that seem to protrude out from the wall, almost like ghosts. The images have linear printed patterns on the surface as if something has been lying on them for a long time creating traces of former presence. In this way, these pieces exist in a field of tension between the material and the ephemeral, between what is and what has been. The wall objects have a strong presence without asking for attention. Silently they are simply there, present in space, bearing witness of something that may have happened. 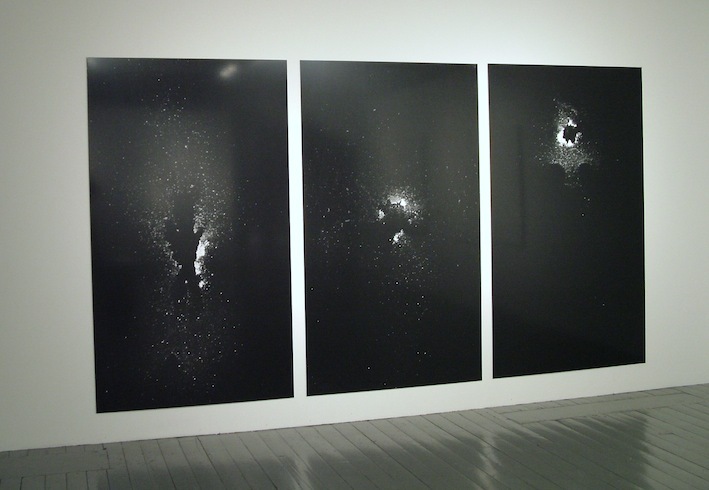 The breath photographs of Lise Bjørne stand in relation to Magelssen’s pieces. The series of images breath rayographs exposes traces of the artist’s breath, or screams, on light sensitive paper, which has subsequently been exposed in the dark room. What the viewer sees on the image is the silence after the sound or the activity. It is the echo that is left on the paper, an absence of sound reminding us of a former presence. The absence is materialized in these images. 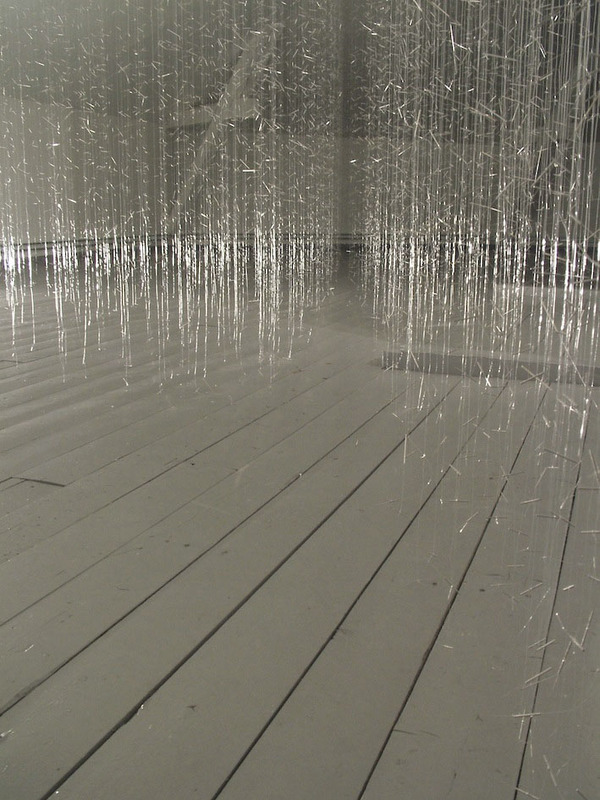 The installation twentytwothousandeighthundredandsixtyseven consist of 22867 used acupuncture needles. They are hung as a veil of light in the exhibition space, fastened to countless transparent threads that are suspended between the floor and the ceiling. Because the needle installation draws in basically all the aspects of the exhibition project White Noise, itcould have been given a more central placing, which would have turned it into the centre of gravitation of the whole exhibition. It has both a material as well as a transparent quality. The needles carry a silent echo from the bodies they have penetrated before being hung in the gallery. Simultaneously the acupuncture needles are meant to activate the (invisible) energy lines of the body in order to enhance the circulation in the patient’s body. Additionally the movements of the audience in the gallery when they pass, makes the needles dance and sparkle in the light. Movement and circulation of energy is something that dancer and choreographer Øyvind Jørgensen also works with. To bring him into the exhibition project gives it yet another dimension. The space is not only activated by a living and breathing body standing in relation to the objects and images, but his presence also highlights the performative aspect of the exhibition, which is especially accentuated in Bjørne’s works. It is possible to interpret her breathing pieces in the growing genre of “documented performance”. It is a conscious choice to invite Øyvind Jørgensen as dancer and performance artist into this project. For many years Jørgensen has experimented with the Japanese dance form butoh. It is a tradition, which works with the visualisation and embodiment of things and bodies no longer present. It echoes human presence and their movements. Many years of training is demanded in order to master this dance form. The dancer has to develop a high level of sensitivity in the body and towards the space. Jørgensen is probably the dancer in Norway who has developed this form the most, and who has found a very personal way of expressing it. His presence in the space relates very well to the former mentioned qualities of this particular exhibition project. So does the soundscape of composer Nils Olav Bøe (Bøe is also a visual artist). In Hamar, his composition was presented through headphones, which the viewer could choose to listen to while watching the exhibition. I would say that his sound could preferably be let out through loud speakers into the space. Perhaps alternating between sound and silence. That would allow the audience to experience the tension between presence and absence, or the echo of what has been, on yet another level.